The West Hollywood City Council last night approved in a three to two vote the Sunset Spectacular billboard on the condition that its 67-foot height be reduced by three feet. The Sunset Spectacular is a digital billboard project and accompanying plaza planned for the city-owned parking lot at 8775 Sunset Blvd. near the Horn Avenue-Holloway Drive intersection. The project is a collaboration of Orange Barrel Media, Tom Wiscombe Architecture, the Museum of Contemporary Art and Walter P. Moore, the engineering firm. It is intended to illustrate the evolution of outdoor advertising in the new media era and encourage other outdoor advertisers to be similarly creative on the Sunset Strip, which is known worldwide for its iconic billboards. The Sunset Spectacular label uses the outdoor advertising industry term for a creative display that incorporates digital technologies. The project approved by the City Council was chosen from among proposals submitted by nine teams, whose members included prominent architects such as the late Zaha Hadid, billboard companies such as JC Decaux and arts organizations such as MAK. The list of nine proposals was winnowed down to four by a jury that included representatives from outdoor advertising companies, architects, planners and urban designers and a variety of City Hall departments. 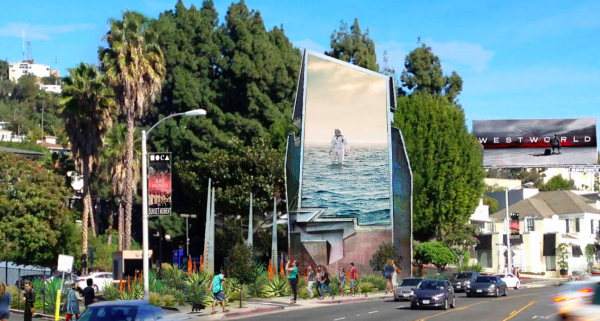 The project originally faced opposition from residents of the West Hollywood Heights neighborhood, who were concerned about the height of the billboard and the impact of light from the digital billboard. The originally proposed three-sided structure was 72 feet tall. It will include three 25-foot wide vertical panels, or “petals,” connected via a skeletal frame. The two petals facing Sunset will have video screens which display digital advertising 80% of the time and digital public art the other 20%. In response to criticism, Orange Barrel Media made a number of changes, including reducing the height to 67 feet from the original 72 feet. In addition, the north-facing petal (the one that does not have a video screen) will only be 21 feet wide its base and 11 feet wide at the top, thereby reducing the overall mass by 18%. The width of the other two petals will still be 25 feet at the base. A resident of a nearby condo last night said she still was concerned about the impact of the light. Councilmember John Heilman pushed Monday night for a further reduction in height. He said he would accept the three-foot reduction, although he would prefer it be reduced further. Mayor John Duran and Councilmember Lauren Meister voted against the project, with Duran saying he supported the original 72-foot design. Meister, on the other hand, said she opposed the project. The project as approved by the Council includes other changes from the original proposal. The more obvious design changes come with the plaza area around the billboard tower. The plaza has been reduced in size by 43% to 2,113 square feet, with no permanent benches. While the original plaza plan called for removal of five parking spaces and two trees, the revised plan keeps all 78 parking spaces and all the trees. I am also a huge fan of Zaha Hadid. I am sad that she is gone. I am sad we didn’t choose her beautiful design as a lasting tribute. Any “plaza” space in this city becomes a homeless camp. With the Typhus outbreak this is cause for concern. Looks like we’re heading to be another Times Square with almost every inch of space devoted to advertising. Ugh ! Well I was hoping that the Great City of West Hollywood would choose Zaha Hadid’s design for the “Sunset Spectacular” billboard but, it appears that the impractical sharp angles won over the better designed smooth curves. 😢 The digital advertising is getting way too much time, instead of 80% it should be capped at 60% with 20% going to digital public art and another 20% going to public interest spots. Zaha Hadid’s design was a true work of art and would’ve given West Hollywood a bold signature. I’m disappointed it didn’t make it through the process.